Jack C. started drinking when he was 16. He was in love with alcohol, which eventually led to stealing Vicodin and smoking pot. As a senior in high school, he received a full ride to George Mason. While there, his addictions got to be too great and he was forced to drop out. He had to move back in with his parents, and then eventually failed out of community college. He sold pot, got pulled over for a DUI, worked as a bartender, and even had to live on the street for five days. “My life goal was just to be high and drunk all the time; I planned to just be a 50-year-old growing weed,” said Jack. There’s no point in denying it, alcohol at the teen level happens. Even though it’s illegal, for some reason our society continues to promote and glorify underage drinking. It’s difficult to find any TV show or Top 40 song that doesn’t mention it. And what’s a teenager to do? All your friends are doing it, you’re a prude if you don’t do it, and besides, isn’t college where things really get crazy? So you might as well get it out now. 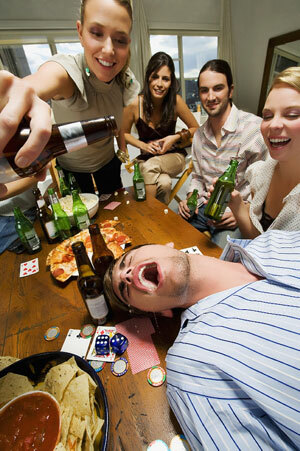 The most influential belief, and the most incorrect, is the thought that alcohol use is rampant among teenagers. According to the Students Against Destructive Decisions (SADD) website, 26.4 percent of underage persons (ages 12-20) used alcohol during the past month, and binge drinking among the same age group was 17.4 percent. That also means, however, that approximately three-fourths of underage persons have not been drinking during the past month. Jan Withers, President of Mothers Against Drunk Driving (MADD), recommends kids and parents talking about the consequences and dangers of underage drinking. “Parents need to talk to kids about basic ways to refuse alcohol,” she says. She also recommends holding a cup of soda, or setting up a code word you can use to call your parents or a friend to let them know you don’t want to ride home with the people you’re with. So think before you drink, is this really something you want to be doing? Weigh the costs, don’t let your friends drink and drive, and don’t get into a car with someone who has been drinking behind the wheel. Give yourself a chance. If you don’t want to drink, that’s totally fine. If you find yourself in a bad situation, don’t engage in risky behavior.